What was the Silver Age of comic books? Superman, Batman, Superboy, etc. Welcome to The SILVER AGE of comic books! Silly! Sexist! Preposterous! Implausible! Absurd! Written for a nine-year old audience but still beloved when those kids grew up! The SILVER AGE! Coincidence upon ridiculous coincidence! Elaborate ruses! Silly plots! Adults behaving like 4th graders! Super villains with galactically overelaborate plans and easily-escapable deathtraps! The SILVER AGE! 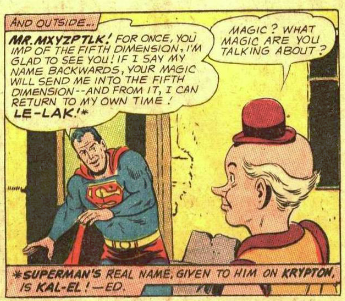 Exposition — enough exposition in every single panel to clue someone as stupid as a bag of hammers into EVERY detail of the story! The SILVER AGE! When the laws of science and physics were adhered as well as a Bugs Bunny cartoon. A time when the super-cats and super-monkeys battled injustice! 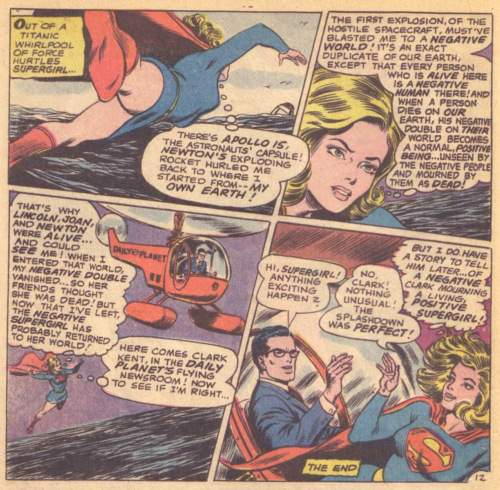 A time when a spaceship landing was just another Tuesday, when radiation GRANTED super-powers, a time when one of Superman’s girlfriends was a mermaid, and when Superman would travel through time to court Cleopatra, battle a space wizard from another GALAXY, save an undersea city, visit a parallel universe, and juggle a planet all in the same five pages! And somehow, it all made sense! The SILVER AGE! Forget verisimilitude! Forget social commentary, relationship complexity, or multi-faceted, complex characterizations. In fact, just forget reality! The SILVER AGE! When the most obvious, simplest solution to any problem was jettisoned in favor of a stupendously complicated, needlessly exaggerated plan — EVERY TIME! Forget logic; forget reason, forget real science or real human behavior — just buckle up for a lot of fun as we cruise back to those sweet, innocent and hilariously complicated, silly comics we loved as kids … THE SILVER AGE! Makes sense. A radioactive METEOR causes a time-travel paradox. 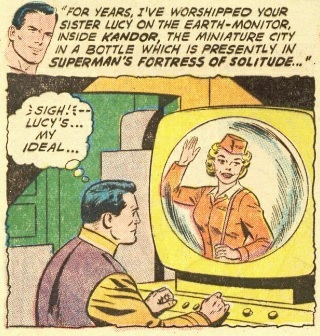 Typical Wednesday in Metropolis. Kudos to Basil Exposition on the left for explaining to everyone exactly what is happening. The ALL-SEEING TV MONITOR — Yes, the TV device that lets you spy on anyone, anywhere, anytime. 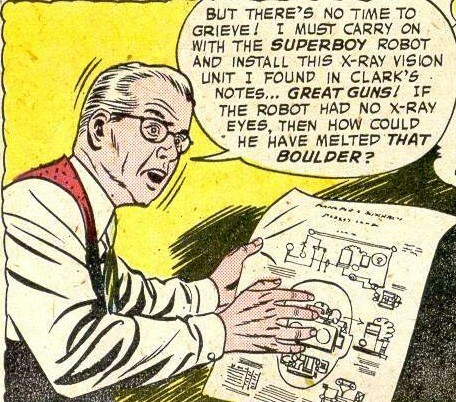 We see a LOT of these in the Silver Age. 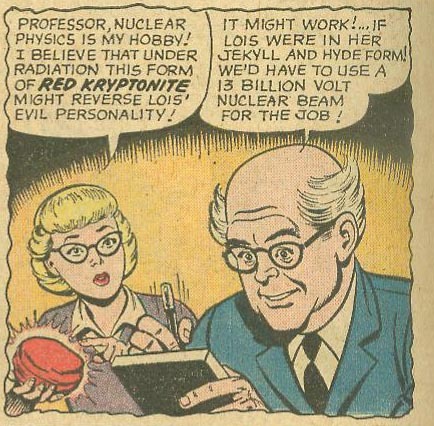 Always good to have a hobby, especially nuclear physics. Now all we need is a 13 BILLION volt nuclear beam. I’ll check Radio Shack. 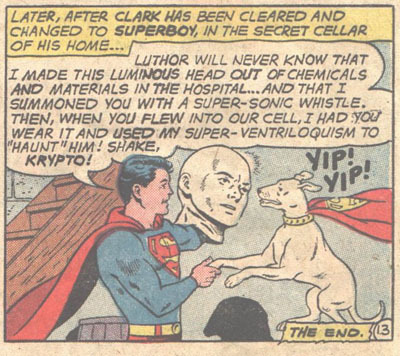 Another example of how Superman/Superboy was just a bit too powerful in the 60s. 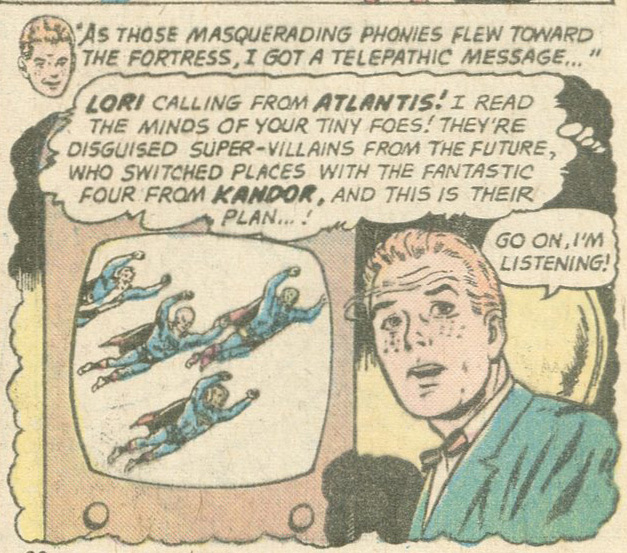 And even the CAPTION makes this an ordinary event, “ONE DAY, IN DEEP SPACE…” Superboy is TOWING about twelve PLANETS from one GALAXY to THE OTHER SIDE OF THE UNIVERSE. He’s says he’s saving countless billions of lives. Ignoring where someone would even find or buy a CHAIN capable of TOWING PLANETS ACROSS THE UNIVERSE, and ignoring how GRAVITY is going to have a big say in what’s about to happen next, don’t you think these twelve INHABITED PLANETS might suffer a little damage by this moving trip? I mean, they are being ripped from their axis, orbit…. And this is PANEL ONE of the story and its only purpose is to set up Superboy encountering a green comet that gives people bad luck. SERIOUSLY. PANEL ONE is THIS and it’s not the MAIN STORY. When you can tow a dozen planets with a chain to the other side of the universe, you’re wasting your time stopping small-time hoodlums in Smallville (which is what the rest of the story is about). 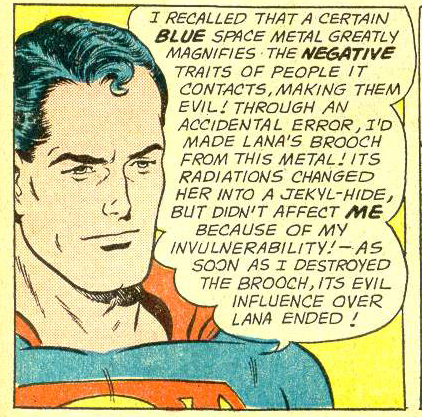 By the way Superboy, the countless billions you saved? yeah, not so much. The space time continuum! No need to worry about semiclassical gravity, quantum effects and general relativity, causality, black holes, paradoxes, quantum entanglement, or any of that complex snoozy science stuff – just go faster than light and you’re in the time barrier where it’s all conveniently labeled with easy to read calendar pages! Makes perfect sense if you’re dumb as a bag of rocks. 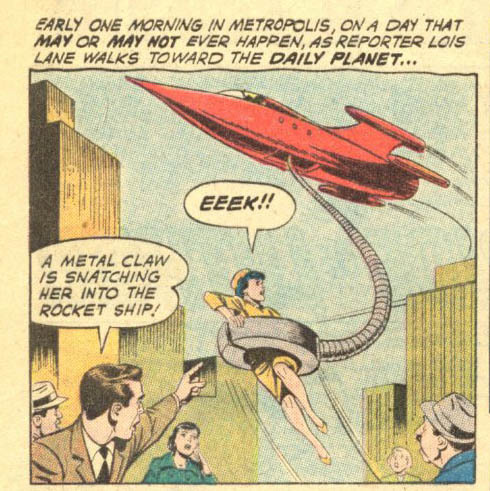 Oh, gosh, Lois Lane tried an experimental device she was told to stay away from! Good thing THAT will never happen again. 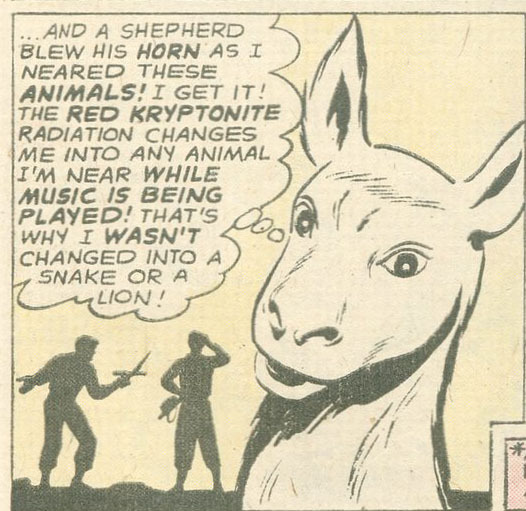 Today’s final exam question: Describe, using SCIENTIFIC METHOD, the LAWS OF PHYSICS, and EFFECTS OF RADIOACTIVITY CAUSING GENETIC MUTATION, the process by which a piece of Red Kryptonite’s radiation metamorphoses a Kryptonian into the animal it is NEAREST TO while MUSIC is being played. 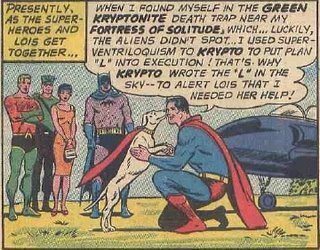 Here’s a great example of how Superman used what we will loosely call, “Science” to defeat the INVISIBLE SPACE ALIENS (really) by realizing that their super-power-take-away ray didn’t take away Superman’s powers if Superman was upside-down! 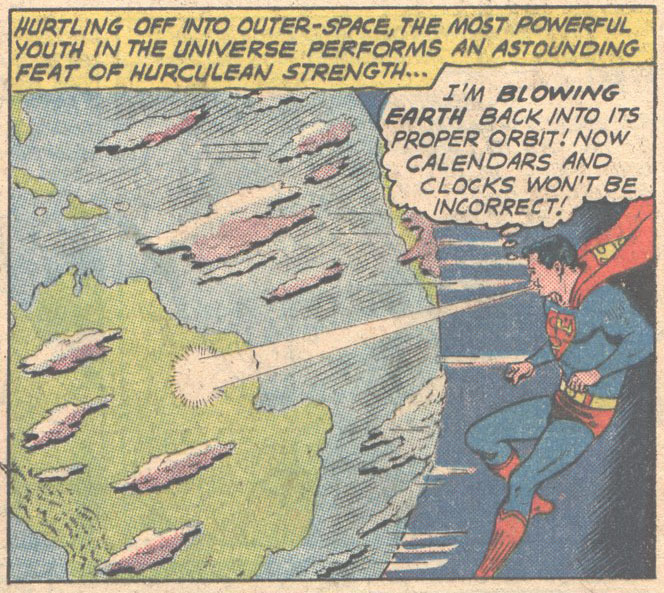 Because, see, as a man of steel (God help us) when Superman was upside-down his magnetic field was in alignment with the Earth’s south (or was it north?) pole and so his powers were not affected and … and… um, aw, screw it, I have no idea what the hell I’m talking about. From 1946 (admittedly NOT the silver age yet) What in the name of Rao Is that thing? 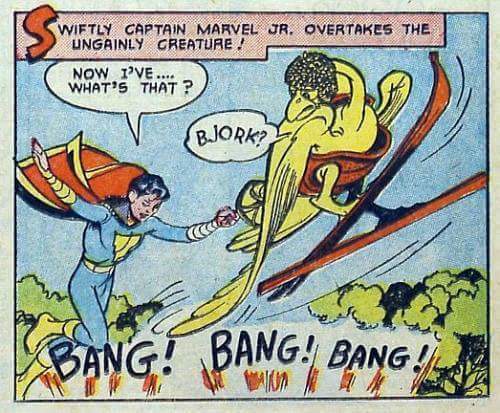 It looks like Captain Marvel Junior is battling a bird who is also a turtle, and the creature seems to be wearing a helmet and (wait for it) SKIs. Yeah, skis. I’d ask, but all it says is “Bjork.” Why is he invoking the name of an Icelandic singer- songwriter who had not been born yet? Pray for death, Jimmy! Pray for death! Not sure what’s more disturbing — what Jimmy is saying or the invisible space alien looking menacingly at the trio with the strange beaker in his hand. Yeah, it’s what Jimmy is saying that’s MUCH more troubling. Experiments? What happens at the Fortress stays at the Fortress. No, SERIOUSLY, this is WRONG. 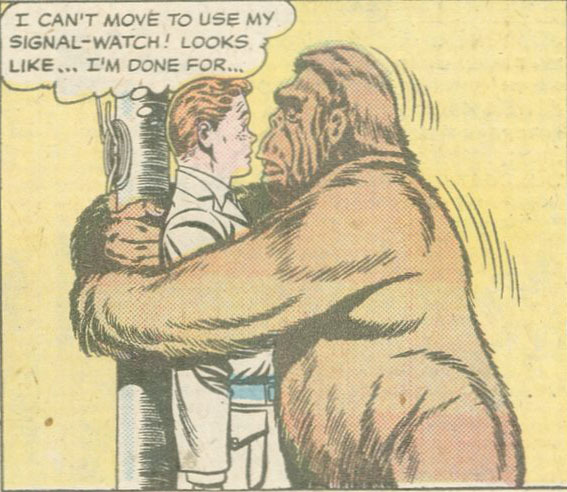 The silver age wasn’t as innocent as we remember. 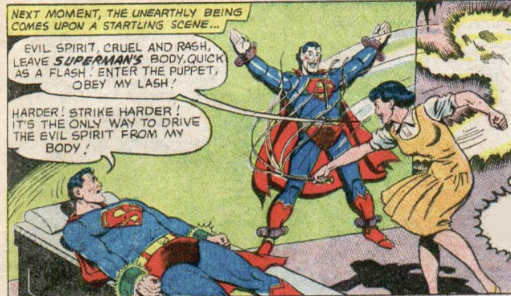 Superman robots have most of Superman’s powers – that thing could have killed her. We know what you’re thinking and you should be ashamed of yourself – you’re disgusting. What happens at the Fortress stays at the Fortress (seems to be a running theme). 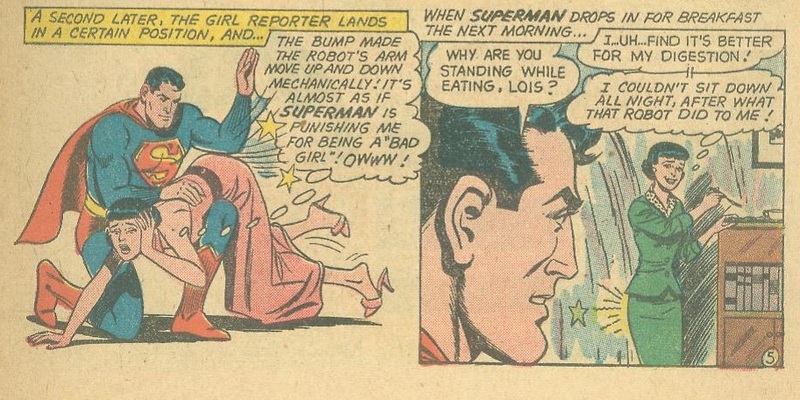 Superman should have insisted on a safe word. 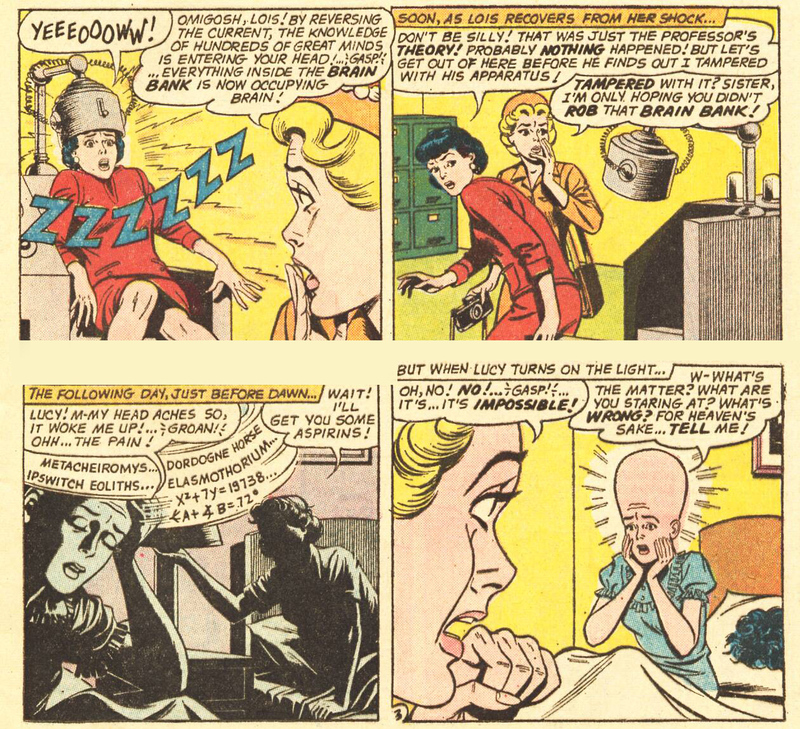 This one got by the Comics Code Authority. 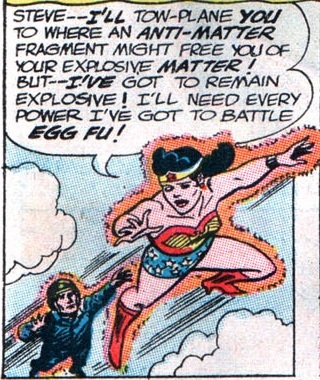 Crisis on Infinite Earths happened for a reason — to wipe out events like this. Sad fact: This is about the SANEST panel from the entire issue. Seriously. 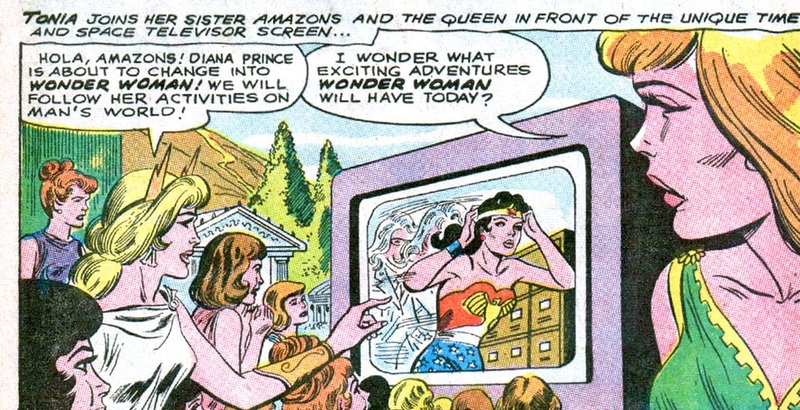 The “ALL-SEEING TV MONITOR,” a very overused comics trope, sees all of time and space — including people changing clothes. This is why you should always cover your web cam with a piece of tape. Were kidnapped through space and time and being impersonated by look-a-likes…. 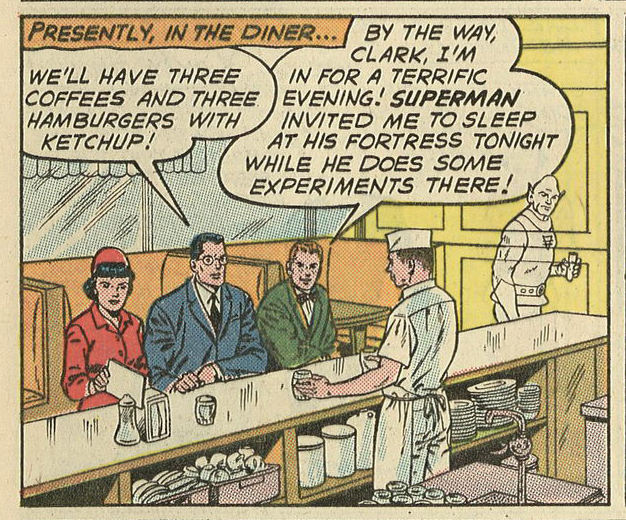 Or, as we like to call it in the Silver Age, a typical Thursday. 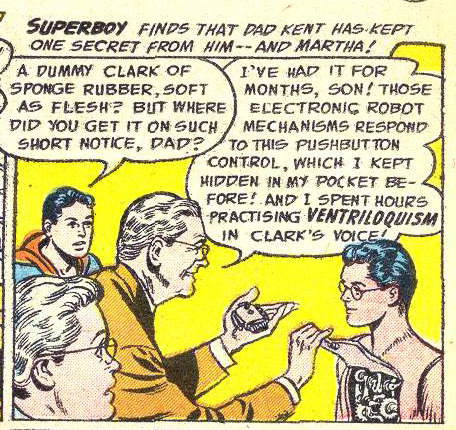 Not too sentimental, the Kents: “Forget that my son is gasping on his deathbed! I have a robot to fix! Wait, could THAT be the clue we’ve been overlooking?” Wow. Just, wow. It’s quite logical, if you’re smoking crack. Eminem → ← Another Millennium? Yawn!